The holiday season should be one filled with love, joy, and peace – right? For too many of us, this sounds ideal but impossible. In a Pinterest and Instagram world, we often find ourselves feeling so much pressure to create “perfect” holiday moments that we can’t even enjoy them. With a little intentionality, spending quality, stress-free time with family and friends is possible. The holidays can be a great time to slow down and connect with those closest to us if we can start to let go of expectations of perfection! Cookie decorating made easy: Baking and decorating Christmas cookies is a classic holiday activity. Just don’t let the process of making the perfect homemade sugar cookie overwhelm you! Kids will have just as much fun decorating slice-and-bake (or even pre-made!) sugar cookies. 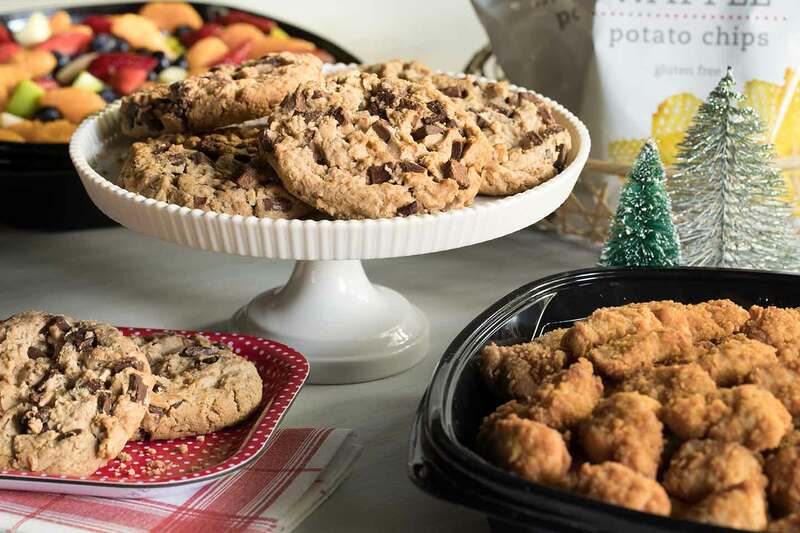 Consider grabbing a Chick-fil-A Nugget tray to have on-hand to balance out the sweetness and keep the cooking to a minimum. Holiday movie night: Gather family or friends for a holiday movie night. Choose a classic flick like “The Polar Express” or “Miracle on 34th Street”, order pizza and make simple snacks. PJs (not matching) required. Christmas lights and Peppermint Milkshakes: Have dinner at Chick-fil-A and top it off with the classic holiday dessert, a Peppermint Chocolate Chip Milkshake. While you sip that sweet treat and enjoy holiday tunes, drive around your local neighborhoods to look at Christmas lights! There’s no better (or easier) way to get into the holiday spirit. Host a “no-bake” dessert swap: Who says this classic party must feature homemade treats? Change it up by asking guests to bring their favorite pre-made treat to share. Warm Chocolate Chunk Cookies are always a crowd favorite, and are available in a six-pack or even a tray. If you have extra time, you could even make them into our Peppermint Chocolate Chunk Cookie Sandwiches – but no guilt if you serve them as is! It really doesn’t get better than a warm chocolate chip cookie and a glass of milk. No matter how you choose to spend your time, we hope you can slow down and appreciate #thelittlethings this holiday season. After all, the best memories are often made in the small moments. Why is peppermint so popular? One of the first signs of the holiday season is that familiar smell of peppermint. It seems to be everywhere: candy canes adorn Christmas trees and all of your favorite beverages get a peppermint pop, including Chick-fil-A’s Peppermint Chocolate Chip Milkshake. It is safe to say the peppermint is the official flavor of the holiday season. Is Chick-fil-A open on Christmas? Our restaurants will be closed on Christmas Day (Tuesday, December 25) as we enjoy the gift of time spent with friends and family—we hope you have the chance to do the same. What’s even better than enjoying a warm Chick-fil-A meal? Being able to share it with others. No matter which holiday you’re celebrating this season, let us help you take the guesswork out of your gift selection. Chick-fil-A gift cards come in a wide variety of styles for friends and family, young and old, and will be sure to delight anyone on your list.